Thanet is renowned for its beaches and coastline – Turner and Dickens were inspired by the landscape and area in general. Through the campaign, senior managers are to be inspired by the possibilities of these roles and the potential for the development and transformation of Thanet. Thanet District Council is undergoing a programme of change to ensure that they can serve the public effectively and efficiently in the current economic climate. The organisation has undergone a restructure from which these new and exciting recruitment opportunities have been identified. In the past, Thanet District Council has struggled to attract the right candidates to fulfill these types of opportunities. To attract potential candidates, particularly those living outside of the area, we needed to raise awareness of the benefits of living and working in Thanet and working for a district council. We needed to take an innovative approach to the advertising to ‘stand out’ and make these opportunities as appealing as possible. A creative approach was key to the success of this campaign. We believed it was important to raise awareness of the benefits of living and working in Thanet as well as highlighting the attractions of working for Thanet DC, specifically at this time of change and restructure. The visual was simple but effective – part of our remit was for the idea to be used for future recruitment campaigns for the council. The advertising activity was through the press and online and was complemented by a careers microsite which plays an important role in communicating this message. The site will was a window into life at Thanet. It’s the ideal place to highlight the personality and vision of the organisation – and to begin building an emotional link with candidates. 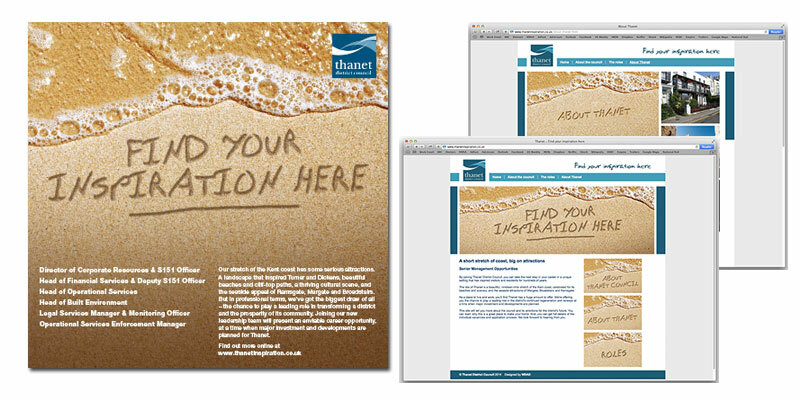 Through the advertising, we were also able to secure editorial which focuses on Thanet as a great place to live, as well as the council being a great place to work. This creative recruitment campaign example has been well received both internally and externally and to date, the microsite has received over 450 visits. As the campaign is still live, we’re unable to tell you the final results – come back soon for an update.